Travel with Kevin and Ruth! : The little blue car is for sale! We bought the little blue car brand new in 2006. It's the only brand new car we've ever owned. The little blue car when it was brand new! I think we paid around $13,000. The little blue car... yesterday! 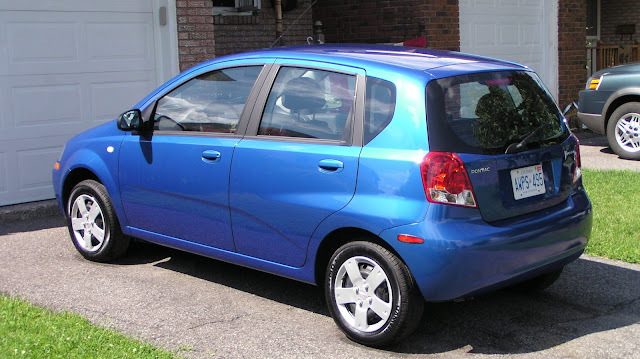 For Sale: 2006 Pontiac Wave 5 door Hatchback. Price is firm at $2,300. The Pontiac Wave is the identical car as the Chevrolet Aveo. Only sold in Canada as a Pontiac Wave. Original owner private sale. Car is in nice shape. All original paint has a few minor scuffs and stone chips, but very minor. Absolutely zero rust and no body damage. Timing belt has been changed at 100,000 kms and 200,000 kms as per manufacturer recommendations. Needs windshield and four tires... otherwise, I would hop in this car tomorrow and drive it anywhere. Factory power windows, power remote locks, and cruise control. No air conditioning. Manual transmission. Mostly highway driven. Stored most winters. I can't believe it's only worth $2,300. I thought about doing the windshield and putting four tires on it and selling it for $3,000, but it's better for the buyer to have the option of putting on snow tires if they want. Price is firm because I hate negotiating, and don't feel right about trying to get more than what it's worth. Whenever we have sold anything, we decide what it's worth, ask a fair price, and make the price firm. Great deal for both the buyer and the seller. I simply decide what is the lowest price that I would be willing to accept, and make that the firm price. So, if you know someone who is looking for a reliable, well maintained, one owner car, this is a great deal! And speaking of great deals... here's a great deal on a digital multimeter. One of these should be in every RVers tool kit... especially at this price! I missed the brand, model and year of the vehicle. Ha... too funny. I have corrected that! The little blue car has served you well! It will almost be like getting rid of a pet. It has served us well and we will be parting with it, with mixed feelings but it just makes sense not to keep it anymore. Almost but not quite. It is funny how you can get attached to something that isn't "alive"! I think it is a great deal, it should sell quickly. We think it is a great deal too but it may not go so quickly because everyone around here seems to want trucks! I think Cabri Regional Park should buy the LBC for $2,299 for two reasons. First, because its best caretakers were expected to drive 86 miles a week just to recycle the park's cans. By my reckoning, that's over 7000 miles! Second, because there is always room for some price negotiation lol.